Who cares if smartphones give you eye cancer and brain tumors? There's something much worse that your cell and tablet are doing to your head: They're giving your neck and lower face a crease. A crease. That's horrifying and you're doing nothing to stop it. According to The Telegraph, the condition dubbed "tech-neck" affects mostly people between the ages of 18-39 and especially those who peer down at their phones or tabs "at least 150 times a day". That sounds like a lot, but how many times do you check your phone for that one email you've been waiting all day for (and then it just turns out to be spam)? If I'm being dishonest, I would put my phone-checking down at like 50 times a day, but it's usually much, much more than that. And with more than one device per person, doctors are now worrying about the "Y zone" which makes up your neck, lower face and upper chest area. Dr Christopher Rowland Payne, Consultant Dermatologist at The London Clinic, said: "The problem of wrinkles and sagging of the jowls and neck used to begin in late middle age but, in the last 10 years, because of 'tech-neck', it has become a problem for a generation of younger women." "Neck skin is exposed to sun every day because of low necklines, especially in women, but people are less inclined to think of protecting their necks than their faces," Dr Rowland Payne. "This is bad news for neck skin as it starts off finer and sun thins it further. Finer skin wrinkles more readily and the fat of the neck may sag." 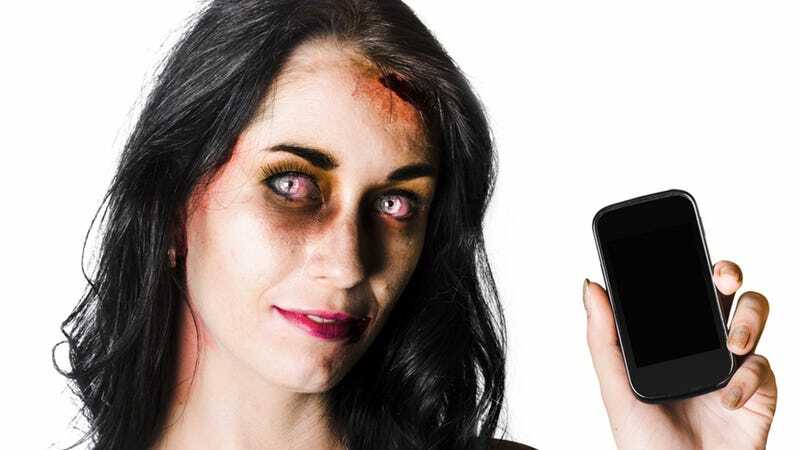 The bad news is that you're probably not going to stop looking at your smartphones even after you've read about this new horror (and you're probably reading it on your phone or tablet now! Hi! ); the good news is that Yves Saint Laurent has allegedly developed the first and only cream that combats tech-neck, making it much easier for you to beg your friends for Candy Crush Soda Land Confectionary lives while looking your best. It's probably also going to be expensive, but eternal youth is worth a little suffering.